I have finally plucked up the courage to write my first ever review post. I am so impressed with Orchard Jigsaws, I had to go ahead and write it. 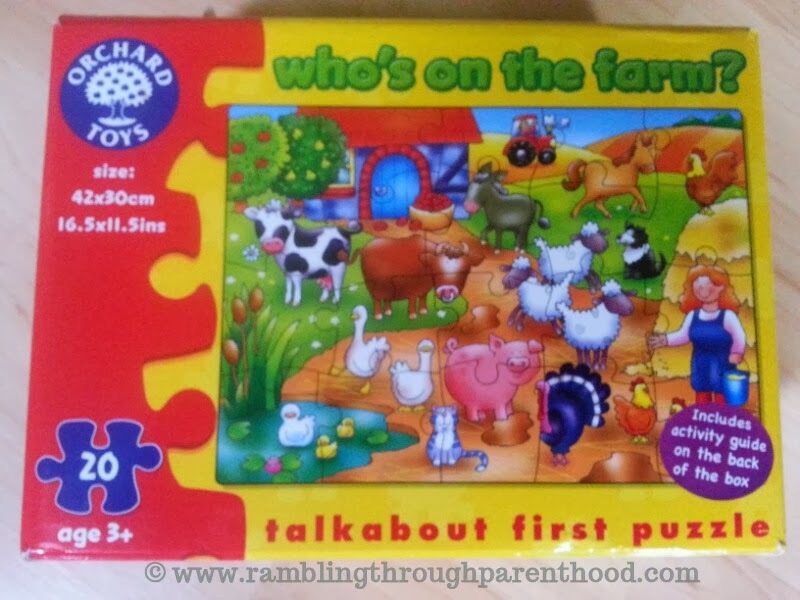 We bought J his first Orchard Jigsaw for his first birthday. 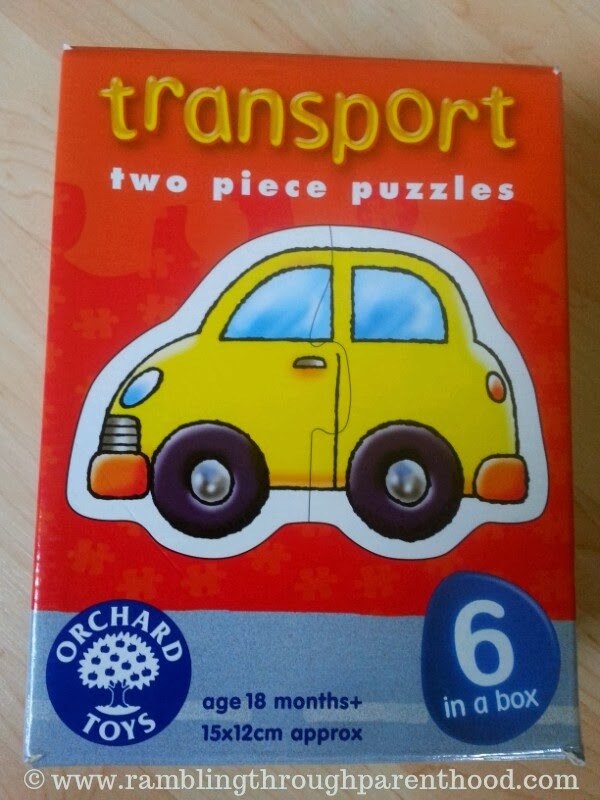 It was the Transport puzzle. It has six individual jigsaw puzzles, each made up of two large, brightly coloured, shaped pieces that fit together. The pieces are quite chunky for little hands to hold and manoeuvre with ease. And strong enough to survive some persistent thumping. 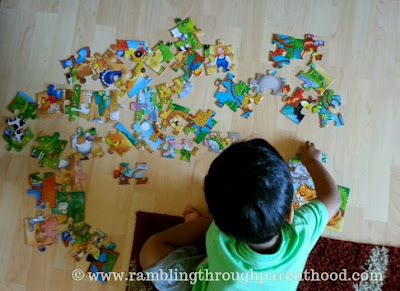 Just perfect for little tots who are starting out in the world of jigsaws. J took to puzzle-solving with such flair, we decided to skip the intermittent stages and jump straight to the bigger jigsaws. Just to challenge him a little bit. months old. It was a bit of a challenge for him to begin with, but he soon warmed to it with a little help. The fact that all his favourite animals were on the pictures just helped matters along. In a few months, he could identify all the animals and could mimic the sounds they make. He could spot the tractor, apple tree and the red wellies too. The 25-piece Who's in the Jungle? was the next Orchard jigsaw puzzle that we bought for J, this one for his second birthday. It proved to be just as big a hit as the previous two had been. He can piece it together all on his own now and knows all the animals - even Flamingo and Hippo! We are absolutely delighted with each one of our Orchard purchases. They have been excellent value for money and have given us many hours of fun. That they help dexterity, problem-solving and vocabulary-building are just an added bonus. As is the fact they are made from recycled materials. The constant feature has been beautiful, bright and vibrant colours that make the pictures rather endearing. The pieces and the boxes housing the sets are very sturdy and have survived boisterous handling by a tot, with very little signs of wear and tear. 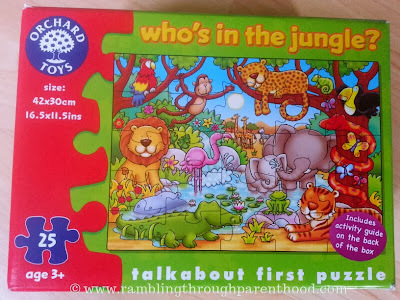 A special mention for the boxes for Who's on the Farm and Who's in the Jungle. Each has a plastic handle for little hands to carry around like a little suitcase. Very charming! J has and is still having a lot of fun with his Orchard jigsaw sets. 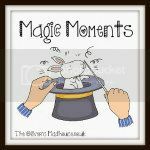 He has pieced them together so many times, he now has a very innovative way of making them even more fun. He has resorted to mixing all the pieces from the three sets together! I must say he does manage to sort them out into their individual boxes when it comes to tidy-up time. The time has come to be more adventurous and venture into the world of Orchard board games now. Or even bigger jigsaws. Wonder what J will get for Christmas this year? The new Animal Games or the Old MacDonald Lotto perhaps? In the meantime, if you are thinking of getting a fun, educational present for a toddler or older child, head over to Orchard Toys. You will not be disappointed. Disclaimer: All the Orchard jigsaw puzzles used and reviewed in this blog post were paid for and purchased by me. I was not offered any incentive or compensation to write this review. Am sure Z will love it! I love love orchard toys puzzles . My 2 1/2 year old is puzzle mad ! I'm always searching nearly new sales for orchard toy ones . As hey provide so much for her to Lear n , talk and discuss . Glad your little man loves them too , well done little man ! Thank you. We adore them in the C-household. Thanks Gauri. I enjoy them too! They really are very good.